At All County Funeral Home & Crematory, we are proud to offer the community a more natural option when it comes to a burial. This option gives you the peace of mind, knowing your loved one's remains will be reunited with the earth once again and conserve land for the future. A green burial or an eco-friendly burial is the most environmentally friendly final resting place. This type of burial has minimal impact on the environment and aids in the conservation of natural resources. Green burials use biodegradable materials that are non-toxic that leave little impact on the earth. You can choose to be buried in a green cemetery. Those that are certified by the Green Burial Council or similar organizations preserve the surrounding habitat by making eco-friendly choices about the management and care of the land as well as using biodegradable and nontoxic items, including embalming fluid and caskets. Other forms of natural burials include cremation. When compared with a traditional burial, and you can choose from urns and other materials that are also non-toxic and biodegradable. There are many benefits to a green burial. Not only do they have a minimal impact on the land, but they also reduce the amount of carbon emissions, protect workers’ health, and can lead to the restoration or preservation of the land. Eco-friendly burials also involve fewer (and, in the best cases, no) toxic or hazardous chemicals. Traditional embalming fluid, for example, is very toxic and even includes known carcinogens. This can cause harm to the funeral home directors who interact with it. Another benefit of eco-friendly burials is that they can reduce the imprint of cemeteries on the land. Traditional burial sites fill up fast, requiring expansion or new sites to be built. These sites can then never be used again for burial or for anything else; green sites may eventually be used for other purposes or can lead to preservation in the future, preventing large companies from building on the land. You have many options when choosing a final resting place, whether you're preplanning for yourself or seeking services at a time of need for a lost loved one. If being environmentally friendly is important to you, you can plan ahead with All County Funeral Home & Crematory. We work with you to ensure all your wishes for final arrangements are handled with grace and professionalism, and we can help you plan an environmentally friendly burial. As a family owned & operated funeral home, it is our mission to make sure we are offering our community the options that fulfill their wishes. Whether you are contacting our Location in Lake Worth, Stuart, or Vero Beach, we will be sure to help you through the entire process of planning ahead or at the immediate time of need. We have been serving the surrounding communities of Palm Beach, Broward, Martin, St. Lucie, and Indian River County for over 30 years. The preferred Cemetery For Green Burial Services would be the Prairie Creek Conservation Cemetery as they are extremely knowledgeable in all facets related to green burial. If you are interested in learning more about green burial with All County Funeral Home & Crematory, please feel free to contact our staff at 1-800-443-5336 or request more information by clicking the link below. Is It Necessary to Be Embalmed? While many funeral providers may encourage families to opt for embalming, especially if they plan to hold a viewing or an open casket funeral, the law in Florida doesn't demand this step. The law only states that a person's remains must be embalmed or refrigerated within 24 hours of the death. Depending on the timeline associated with the funeral, you may still be able to hold a viewing even without embalming. Choosing not to embalm reduces the use of chemicals in a burial and keeps fluids drained from the body from being integrated into public sewage systems. It can also reduce the costs of final arrangements — refrigeration is less than a fifth the cost of embalming on average. Natural coffins and caskets are those that are biodegradable. They may be made of cardboard, pine or bamboo, among other materials, and they don't typically include components such as metal hinges or handles that would be left behind in the soil even years later. 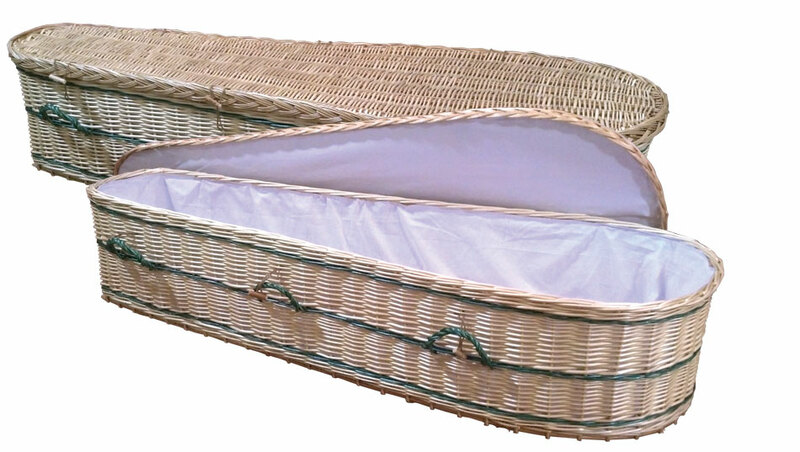 Instead, these coffins and caskets may come with cotton rope handles or other features that support functionality during a funeral and burial. Natural coffins are usually finished, if at all, in eco-friendly products rather than chemical-heavy paints or stains. Some natural coffin manufacturers make kits that can be shipped in flat packaging and put together on site to reduce the transportation resource requirements of distribution. This adds even more environmentally friendly benefits. What Kind of Memorial Service Can You Have With a Green Burial? The type of memorial service you can have with a green burial depends on the proximity of a green cemetery and the timeline of events. If the memorial can be held quickly, you may be able to have a more traditional viewing and burial. In cases where the memorial will take place more than three days following the passing of a loved one, you may need to move forward with burial immediately and schedule a memorial service and celebration of life later. In this case, you can have any type of memorial you like, but the body will not be present for viewing. Another option individuals choose when they are concerned about the impact of burial on the environment is cremation. With this option, you can choose to have a memorial at any time. The cremated remains may be present at that event. Why Are Green Burials Popular?